Come one – come all to the Snowball Arena for a friendly ice battle of epic proportions! 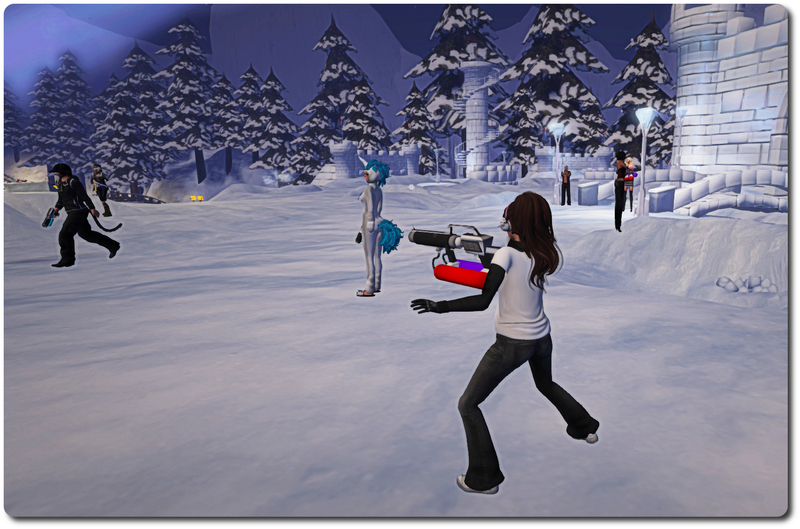 We’re bringing back the Official Snowball Showdown – where you’re free to pelt your fellow Second Life Residents and Lindens with a bevy of sparkling snowballs! If you missed last year’s battle – now’s your chance to get some snow slinging fun in an icy free-for-all at Winter Wonderland. Join us on Monday, December 21st between 10 AM SLT and noon SLT. If you’re looking for the latest in snow-slinging arsenal, be sure to grab your free snow launching weaponry from the vendors around the arena. Premium members can unlock even more powerful artillery. Mark your calendars, assemble your dream team of friends, and meet us in the snow! The 2015 snowball fight – which marked a return of the event after a lengthy absence – was a pretty robust and fun affair. This year, with a greatly expanded arena space and the odd monster thrown into the mix, promises to be far more of an occasion. So, reconnoitre the playing arena, if you are Premium, grab your upgrade badge from a Premium kiosk, and get ready to lock’n’load on Monday, December 21st, from 10:00 SLT. As I recently reported, Art at the Park, located at Holly Kai Park, re-opened on Thursday, December 17th, 2015 with an exhibition featuring six very talented individuals, some of whom you may be familiar with through their art, and some may be somewhat new to you, given they haven’t widely exhibited their work in-world. They are: Boudicca Amat, Kess Crystal, Jaydn Firehawk, Johannes1977 Resident, Nico Time and CioTToLiNa Xue. The re-launch of Art at the Park has been a personal project for me, as regular readers will know, having been asked to take over curating the park’s art events by estate owner Nber Medici. As such, when it comes to previewing this exhibition. Given this, rather than writing a review of the exhibit itself, I thought I’d offer some thoughts on why I wanted these particular six people to be a part of this inaugural exhibition for the re-launch. Since its original inception in 2008, Art in the Garden / Art at the Park (to give the programme its original and continuing titles) has tended to offer a mix of art from photographers and artists in SL on a rotating basis, with special events added to the mix. In taking over the role of curator, this was very much something I wanted to continue, and it will hopefully be the hallmark of exhibitions and shows at Holly Kai Park going forward. As a part of reworking the Park, Nber and I also agreed that we wanted to try to focus as much on artists and photographers who may not be “regulars” on the SL exhibition circuit as much as those who might be regarded as “established” exhibiting artists. This decision also played a role in the selection of these six people for the re-opening exhibition. This latter point is why I’m especially thrilled that Boudicca Amat and Kess Crystal accepted invitations to display their work at Holly Kai. Both are extraordinary talents in art and photography, but neither has particularly sought to offer their work for in-world exhibition – and i personally feel that SL’s art and photography scene is the poorer for it as a result. I’m sure anyone who has seen either Boudicca’s Flickr stream or Kess’ Flickr stream will agree. Both ladies present very different styles, and somewhat different approaches to their work, but the end results are unmistakable in the deep of narrative and emotive power evident in their finished pieces. I’ve always found the studies they each produce to be deeply compelling because of this, as well as deeply admiring their individual techniques and skills in developing their images. I also really hope we’ll get to see more of their work in galleries across Second Life. Johannes1977 “John” Resident is well-known in the art community as an artist, photographer and entrepreneur. His work has been widely displayed in Second Life and can be found on his Flickr stream and at his in-world gallery. I first encountered John’s work at Angel Manor, where he was exhibiting a series of images he took while on deployment with the US Marines (in which he is a serving officer). Since then, I’ve never ceased to be drawn to his work, wherever it is displayed. His range of styles and approaches is such that any series of pieces his produces tends to be completely fresh and original in and of itself – as demonstrated in his display at Holly Kai Park, which features six images of his mother’s beloved Germany, which are dedicated to her memory. Jaydn Firehawk and Nico Time are two Second Life photographers I’ve admired for a good while, and as such, very much wanted to feature them at Holly Kai Park. Jadyn’s work covers both the physical world and Second Life, and as she notes in her biography, is often informed by her disability, which she notes has bestowed a mantle of intensity in the way she sees the world. At Holly Kai, she presents two sets of studies to visitors:one in colour, the other in moncohrome. Both demonstrate that photography from the physical world can and does translate into the virtual as a means of artistic study. Be sure to visit her in-world gallery.